Purple Light Entertainment consists of two main artists, Rip and Prano. Rip and Prano grew up in and all over south Florida. These two artists write and compose their own music. With the Latin sensation Jhoni, (from LD and Jhoni) singing and producing on some of their tracks, this team makes a great combination. 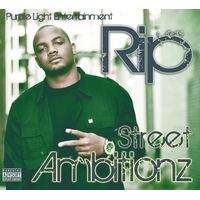 Check out Rip's newest album "Street Ambitionz" on iTunes!! nice music.. shake my body..shake my soul..